Cinematically there are few things as perfect and beautiful as Werner Herzog operating at the top of his game. When Herzog clicks with his subject the most amazing mind blowing things happen. With INTO THE INFERNO Herzog is (mostly) operating that in rarefied air where cinematic classics dwell. This film is nominally a trip around the world with Werner Herzog and his co-director Clive Oppenheimer, a vulcanologist to see active volcanos. Herzog met Oppenheimer during his trip to Antartica for ENCOUNTERS AT THE END OF THE WORLD. The pair fell in with each other on the edge of a crater and have been talking ever since. 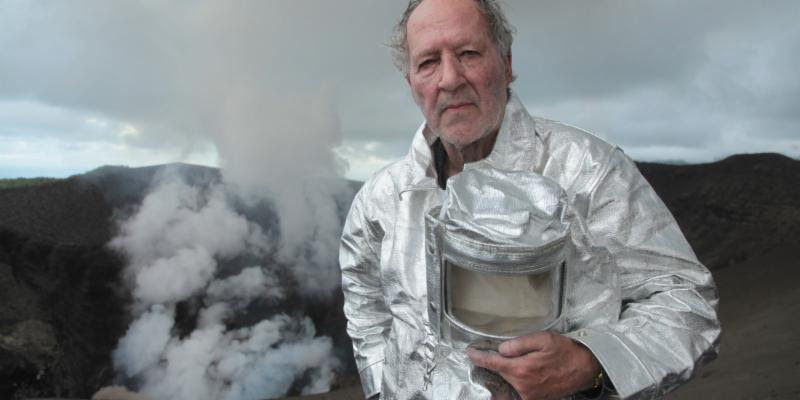 The trips allow Herzog to ruminate on the volcanos, the lives of the people who live by them and his career (Herzog has been chasing volcanos for decades). Leave it to Herzog to go off with a scientist and and end up making a film that is mystical and more interested in the unquantifiable questions concerning the effects of the living mountains on human beings Clearly Herzog knows that they haunt people since they have been in several of his films going all the way back to the marvelous LA SOUFRIERE where he went to an island that was about to explode. Herzog's examination is book-ended with the words of two tribal elders on different islands of the same archipelago talking about the spirits that inhabit the volcanos. The sequences are not condescending nor funny. We don't laugh at the men, the first, because his sincerity comes through so clearly that it's impossible not to believe him, while with the second we have traveled long enough and far enough with Herzog that we accept hat he is saying as a kind of truth. While Herzog's contemplations are interesting, what givess the film and Herzog's words their power are the visuals. A mix of old and new footage both from Herzog and by others showing the volcanos erupting, sputtering or just simmering. Herzog gives us some of the most amazing things you'll ever see and and they are of such power that you come to understand why the living mountains have such a hold over the people living around them. If I saw the things in this film on a regular basis I too would find them mystical. The images are so over powering that I want to see the film several more times just to see the imagery. Problems or no INTO THE INFERNO is an amazing film. In a weird way it's one of my favorite Werner Herzog films because when it's on and the sound, narration and image link up it becomes one of the great brain expanders of the year. This is a magical film that should be seen as big as possible. I can't recommend this film enough. INTO THE INFERNO is heading for Netflix on October 28, but the film is getting festival a nd theatricalscreenings so if you get a chance see it- preferably on a big screen where the sound and image will leave you in state of ecstatic giddiness.